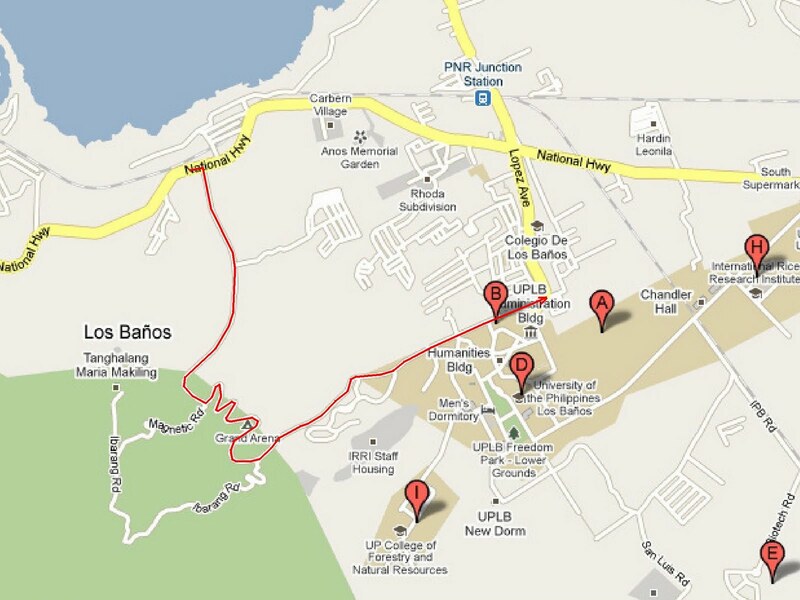 It's been a few times now that we've gone to the University of the Philippines in Los Banos or UPLB for short. The first time was when we decided, on a whim, to visit on a late Sunday afternoon. It was simply a joy ride to do a little sightseeing inside the campus. We were still awaiting back then for Che's Admission to the University. 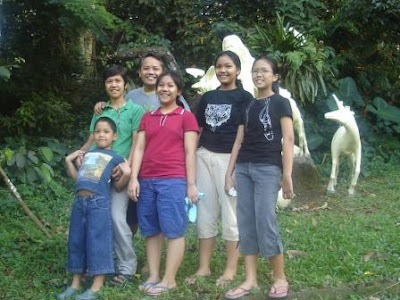 Here's one of the pictures taken there, right in front of the Maria Makiling statue. This was taken in Feb, 2009. Che was eventually admitted to UP Manila. And when it was Karen's turn, we visited the UP Los Banos a few more times for her enrollment and for her boarding house accommodations. I've heard of a certain shortcut to UP Los Banos from the parents of Karen's classmate Poline but didn't know where it was. Strangely, there are no signs along the National Highway to indicate that there was even a shortcut. It was only last Monday though that I learned where this shortcut was when we passed through it on the way home. Going to UP Los Baños last Monday to settle Karen and her stuff at the boarding house, we passed by a fender bender involving a van and a bus. The heavy traffic was already extending from the junction towards the street (Lopez Avenue) that's leading to UP Los Banos (UPLB). That was when we wanted to attempt the shortcut going back. Fortunately, before the trip, I printed a few maps courtesy of google maps. I was just guessing the maps I printed included the talked about shortcut to the university from the National Highway. And I was right. This is assuming that you're taking private transportation and are coming from the western side of the map above. Typically, this means you might be coming from the Calamba or Pansol areas. Incidentally, if you're coming straight from the SLEX (South Luzon Expressway), there's a shortcut to Los Banos and Pansol that bypasses the Calamba Crossing Junction. Traveling along the National Highway after Pansol, you'll see other resorts like the 88 Korean Resort and the Hill Spa at the right side of the highway. Then you'll pass by Splash Mountain Resort and Palm Springs Resort on the left side of the highway. Start slowing down and be on the lookout for the Boy Scouts of the Philippines (BSP) Headquarters, Laguna Council. This is on the left side of the highway. Immediately after that, you'll see a small intersection along the highway. There's a road to the right and at its entrance you'll see the signs of Pook ni Maria Makiling Resort and the PCARRD-DOST (Philippine Council for Agriculture and Natural Resources Research and Development. From the National Highway, turn right on that road. On this road you'll see subdivisions on both sides of the road and the PCCARD-DOST offices on the left. The road then starts to enter a hilly forest. You'll then pass through the Philippine Boy Scouts Jamboree Site and the road is called Jamboree Road. BE VERY CAREFUL. Jamboree Road has many hairpin curves and some portions of it are steep. Continue along Jamboree Road until you see a guard house near a vista point on the left side of the road. Beyond this point, Jamboree Road becomes UPLB's Kanluran Road and you're now in the UPLB grounds. Continue along Kanluran Road and soon you'll be at the UPLB Main Gate. I've only seen light vehicles like cars and small vans traversing the Jamboree Road, so the traffic is generally light. There seems to be no public transportation to clog the road. I've not seen tricycles or jeepneys plying Jamboree Road. As Jamboree Road passes through a hilly forest, the place is relatively scenic. Since the shortcut passes the hills and mountains of Makiling, Jamboree Road can be quite treacherous especially at night or when it's raining. The road is narrow, so there are portions where there may be no place to park in case of emergencies. Since I've not measured (via the trip meter) the traveled distances, the shortcut's entire length may NOT actually be shorter than that of the usual normal route. If you take this shortcut, you'll miss the famous Orient Buko Pie store which is popular for its "D Original" buko (coconut) pies. I'm happy I discovered this shortcut, but generally, I do NOT recommend taking this shortcut to UP Los Baños unless you're sure there is heavy traffic to avoid at the National Highway leading to UPLB. Because of the steep inclines, going to UPLB using this route is more difficult compared to coming from UPLB, so you may want to take that into consideration. hahaha, people from UPLB don't normally buy Original buko pie but Letty's. There is a small outlet in front of the Agapita Complex at the right going to Crossing from the Gate. I am amused at the long post i didn't know it will take that long when written, because for us, we just know! Really? Original is where most people (many of them tourists) go. I like their pies. For the sweet tooth, Dely's near Tagaytay rotonda may be a better choice. I like that one too.